IETC self-performed the project Design-Build (performed the engineering, equipment procurement and construction all in house). The project consisted of (72) cottages or (36-duplexes) depending on how you looked at it, for retirement living. We were responsible for the power distribution around the cottage development which consisted of 12,470V underground feeders. This was made possible through medium voltage switches and single phase transformers. We furnished and installed all equipment including the concrete vaults that the power equipment mounted to. 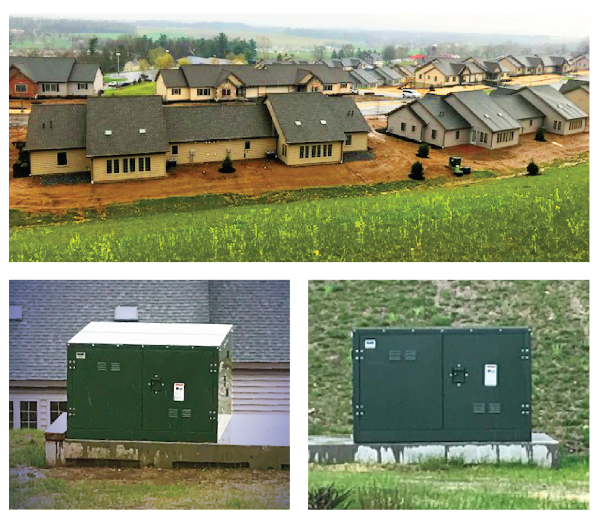 We also provided 240/120V single phase underground feeders from the transformers to each cottage and installed power metering at each transformer. In addition, we installed the telecommunications and fire alarm to each of the cottages, furnished and installed all LED street lighting, as well as, coordinated with the Owner (Masonic Village) and the General Contractor (Warfel Construction) to deliver a sound system and meet the delivery date schedule. This was a high-end, fast paced project with many hurdles and included a high-level of coordination with the General Contractor and owner. For more info on Masonic Village visit masonicvillages.org.